Sptbn1+/– Smad3+/– mice develop multiple tumors and phenocopy features of BWS. (A) Tumor incidence in double Sptbn1+/– Smad3+/– (n = 15) and in single Sptbn1+/– (n = 43) and Smad3+/– (n = 30) mice. (B) Anterior linear ear lobe crease (red arrow) and frontal balding (pink arrow) are nontumorigenic hallmarks of BWS. Sptbn1+/– Smad3+/–mice spontaneously develop multiple primary cancers (black arrows) by 12 months of age, including (C) colon adenocarcinoma, (D) hepatocellular carcinoma, (E) small bowel adenocarcinoma, and (F) lung adenocarcinoma. Scale bars: 10 mm. 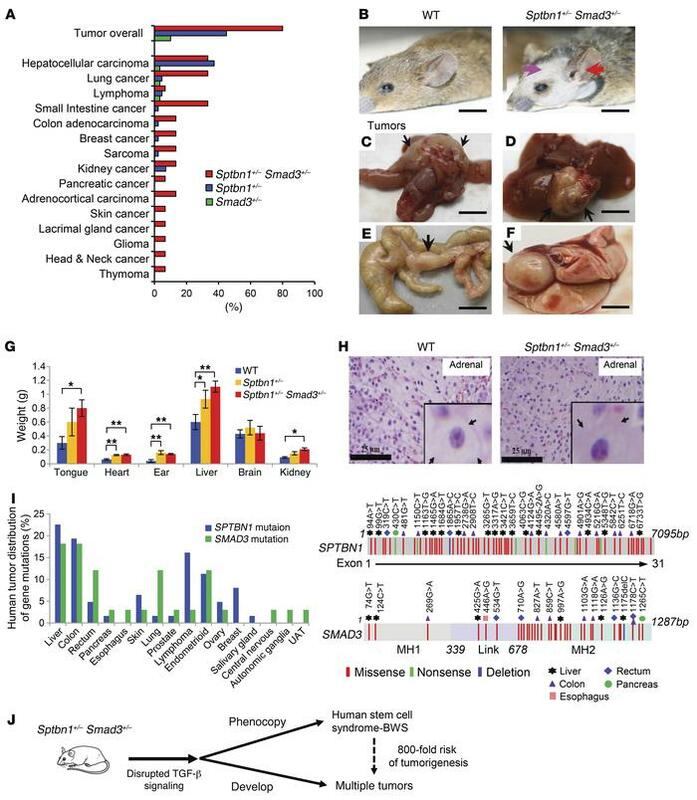 (G) Enlargement of organs in Sptbn1+/– Smad3+/– mice at 4 months of age. Error bars are shown as SD. n = 3. *P < 0.05; **P < 0.01, 1-way ANOVA with post-hoc Bonferroni’s test. (H) H&E-stained sections reveal adrenal cytomegaly in the fetal adrenal cortex of mutant Sptbn1+/– Smad3+/– mice not seen in wild-type mice. The arrows point to an adrenal cortical cell with enlarged granular eosinophilic cytoplasm and large hyperchromatic nuclei in Sptbn1+/– Smad3+/– mice compared with wild-type mice. Scale bars: 25 μm; original magnification, ×60 (insets). (I) Somatic mutations in SPTBN1 and SMAD3 occur frequently in multiple human cancers. The contribution of tumor types (left panel) and the location of somatic mutations (right panel) were summarized on the basis of the data set from COSMIC. (J) The diagram shows that Sptbn1+/– Smad3+/– mice phenocopy features of BWS and develop multiple tumors.